If you’re in Vancouver, Grand Prix Hobbies on West Broadway sells both Weldbond and Elmer’s products. Check ’em out here. In the midst of a frenzy of craftiness a few days before Christmas, I decided to make hand-made gift card wallets (check out Hambly Screen Prints for a great tutorial). My enthusiasm was briefly thwarted when I realized I needed to find a vegan glue and I didn’t know where to start. When it comes to glues of any sort, is safe to assume none of them are vegan and then work from there. Thankfully, with a little bit of research I discovered two widely available commercial brands: Elmer’s and Weldbond. Elemer’s FAQ indicates that it neither uses animals nor animal products in the making of their glues. That white glue you used to take to school as a kid? Yep, it is indeed vegan. 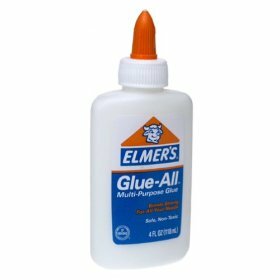 Elmer’s offers a wide variety of synthetic-based glues, including spray glues, glue sticks, tacky glue, rubber cement and many other specialty products. I just about swooned when I saw there was spray glue. Oh the possibilities! I feel uneasy using elmers as the logo is a bull? I hope they really are vegan friendly. Thanks for the info. Im trying to hunt down vegan peel off glues.